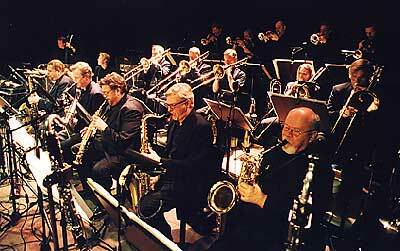 Project The DANISH RADIO JAZZ ORCHESTRA - is Europe's longest established professional jazz orchestra. In 1997 the DRJO toured Australia to standing ovations. As part of a world tour in October 2001, the DRJO returns to Australia playing the music of legendary Danish composer, conductor, and trumpeter PALLE MIKKELBORG - 'THE VOICE OF SILENCE' is a hauntingly inspiring magic/musical journey dedicated to the visual arts and written as a theatrical celebration of the Louisiana Museum of Modern Art in Denmark. PALLE MIKKELBORG - visited Australia to high acclaim on two occasions in the 1990's (Trio 1994 - with Australian Arts Orchestra 1997) - He is a magical trumpet player, arranger and composer of international status. He is also a conductor and band leader with a rare talent for interpreting a score and bringing out the best in a big orchestra. In everything he does PALLE MIKKELBORG brings the sounds of his music close to magic, blending the spiritual and the visual with the physical....a deeply touching experience. Apart from his Trio formats PALLE MIKKELBORG is best known for his works with large ensembles, and his collaboration with MILES DAVIS for whom he wrote, conducted and recorded the Grammy winning 'AURA' suite in 1985. PALLE MIKKELBORG was awarded the 'Nordic Council Music Prize for 2001', the most prestigious music award in Northern Europe.